The Robberg Peninsula is a nature reserve and national monument that lies about 8km south of Plettenberg Bay. It is a beautiful and remote rocky peninsula, one of the most popular walking destinations in the Garden route. 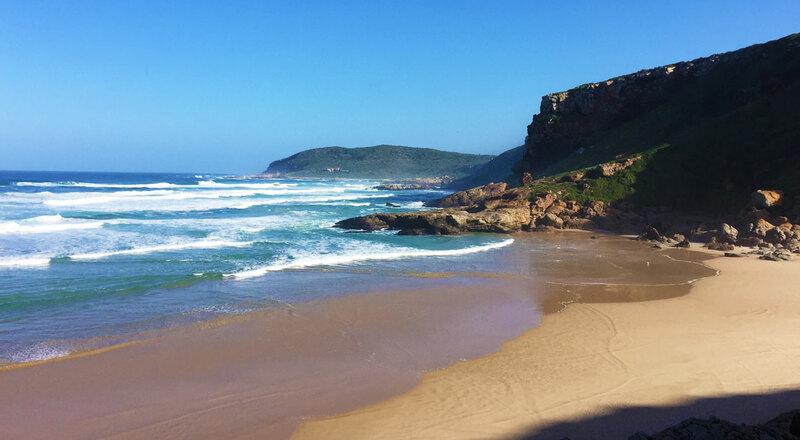 The Reserve is one of Plettenberg Bay’s iconic landmarks and has spectacular scenery and views out to the sea, you are bound to spot a Cape fur seal as their colony is nearby. During the whale season the Point is also an ideal place to spot whales and dolphins. The last time we did this hike we spotted a massive great white shark. Bird spotting is also popular as there is a huge diversity of bird life. This rocky headland presents a fine example of how plants and animals adapt to the interacting influences of land and sea, rocks here date back to the early Cretaceous period and are roughly 110 million years old. Robberg offers a choice of three circular trails of increasing difficulty and distance (from 45 minutes to 5 hours). The round trip that leads one right to the Robberg Point is wonderful but can be dangerous at high tide and not recommended for young children. Please be prepared for sudden changes in weather. • Open daily 7am to 5pm. Open till 8pm in December/January.